In his speech the Director of CISform, Dr Wilders explained about CISForm and presented that CISForm is one of the centers of study and research at UIN Sunan Kalijaga Yogyakarta which concentrates on handling the phenomenon of radicalism by using soft approach. Recent studies show that the average reading habit of young people in this country is less than ten percent. But reading habits are very important in enhancing knowledgeable individuals. Interestingly, online social media is chosen to be an alternative and a profitable platform to get the latest news and information. This is supported by the fact that many young people have recently chosen easy access to gadgets and the internet in searching and learning everything including religion. CISForm believes that through these animated films arises one of the most effective ways to reach youth in Indonesia. Through social media, campaigns about Islam will be easy to reach all targets. This is where the CISForm religious animation can contribute to shaping a moderate understanding of youth about Islam through the messages conveyed within it. 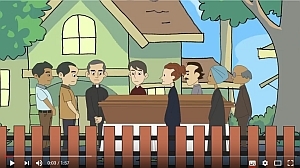 The hope of animated videos uploaded on some popular sites (such as Youtube) can be a tool to emphasize the idea of ​​radicalism to the youth through messages that are packed in a funny and entertaining animation as well as counteract the flow of radicalism among youths vulnerable to radical propaganda such as Wildfire. Animation film is expected to be counter-narrative effective through the internet ie media sites / websites, youtube, facebook, twitter, instagram and other social media). And the most important is also at the same time campaigning a moderate Islam and tolerance. Animation is chosen because it is easier for anyone to accept, especially among teenagers and youth who are particularly vulnerable to the propaganda of radicalism commonly spread through the media. This animation can be played and downloaded on several social media accounts owned by youtube, facebook, twitter, and instagram of CISForm UIN Sunan Kalijaga. NOTE: Speech is Bahasya Indonesia. Subtitles can be activated to English. Screenshot of Youtube Playlist is given below. Click the image to go to Youtube.